At the city Motala on the eastern shore line of lake Vettern a big excavation that in part is still on- going that concerns the mesolithics. The excavations are being done by Riksantikvarieämbetet (the National Heritage Board) UV Öst (RAÄ UV Öst) (link in Swedish about the excavation) and by Stiftelsen Kulturmiljö (link in Swedish about the excavation). The excavations concern at least one settlement and several different activity areas; production sites, graves etc, that are dated to ca 6000-4000 BC. There are also remains of a medieval farmstead, dated to ca 1200-1300 AD. There are several things that are special about this site among them the exceptional preservation environment, UV has made this film, with English subtitles, that allows you to find out more about this exiting place and the finds that has been made. 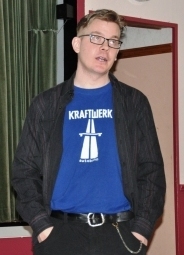 The film is produced by Martin Wanngård at BringitoLife during 2010 and 2011 and is 18 minutes long and is part of RAÄ UV Öst’s intermediary of the results. This Saturday I’ll attend a theoretical osteological work shop at the Osteological research laboratory, Stockholm University with the title: Att stå på flera ben (To stand on several bones). The work shop will be led by Ph.D. Anna Källén and Ph.D. Ing‐Marie Back Danielsson who will address different aspects concerning different social contexts such as genus and ethnicity, critical perspectives. It’s always interesting to meet other osteologists and to get forums for discussions about osteology and methods. This weekand we visited Blankaholm on the Swedish east coast for the Blankaholm seminars arranged by archaeologist and local resident Michael Dahlin, who is also the man behind the Swedish archaeology blog Misterhultaren. 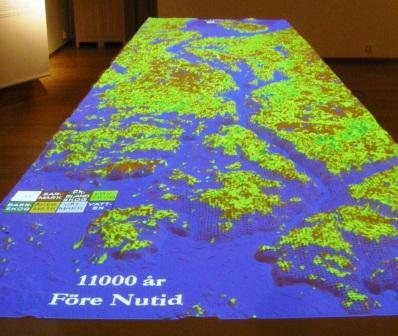 All seminars are connected via the prehistory or history of the Swedish east coast, the themes are varied as well as the periods. All in all it was a very nice session with many nice meetings, new and old, and lots of information. 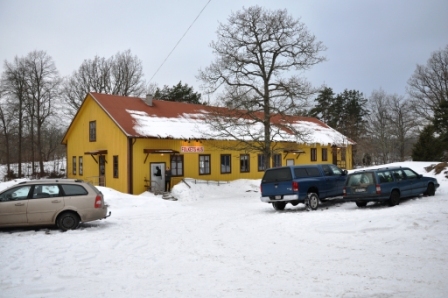 The previous three seminars are available in the books Forntiden längs ostkusten 1 (2010) and 2 (2011) (Ancient times along the east shores) both edited by Kenneth Alexandersson et al. 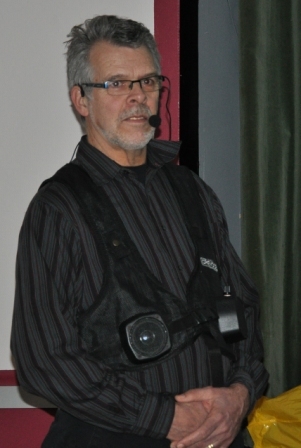 I will not go into detail on the seminars but only give a short recap of them to present what can be expected of the coming Forntiden längs ostkusten 3 and the 2012 seminars. bones from the hearths looking at spices as well as dating. We return to Småland and hits the neolithics once again as Ludvig Papmehl-Dufay discuss the Funnelbeaker culture. 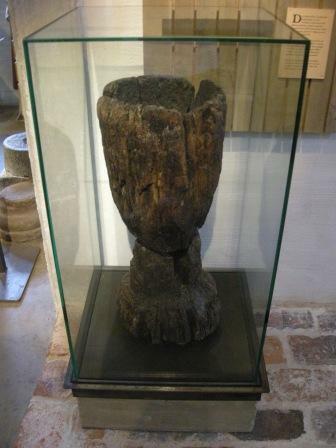 The funnelbeakers are considered as the first real farmers in Sweden. Ludvig is working with materials from the island Öland in his post-doc research. 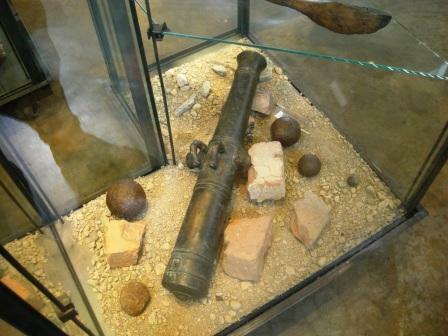 Among them results from a settlement excavation at Resmo. 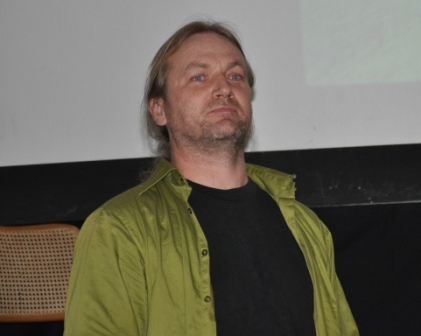 The day ends with another fellow archaeology blogger Martin Rundkvist from Aardvarchaeology who spoke on projects done and projects to come concerning Bronze Age sacrifical deposits, in both wetlands and on human settlements, etc. His idea is to look for the sites found in the late 1800’s and first half of the 1900s and excavate these again. By categorize them due to location and natural features etc. create models to predict where to find new places. 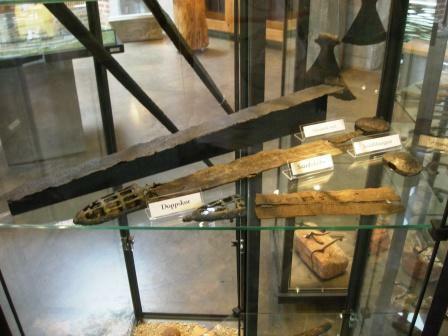 Almost all sites we know of today were found by framers while draining wetlands to create new farmland or working behind the plow seeing what it plowed up. This ended the sessions of day 1.
museum goes forward in time and tells a tale of a tar production site from the 18th century. The site was just outside of Målilla and excavated in 2010. Very nice findings and interesting results. Back to prehistoric times with Joakim Wehlin (sorry all pics were out of focus) who research ship settings on Gotland. 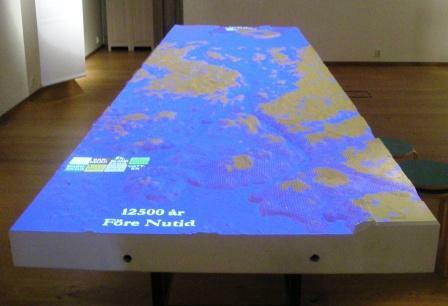 There is a much larger material than I knew; in total 380 are known at Gotland whereof ca 100 are excavated. Joakim told us about an interesting excavation from this summer where they found a double grave in a small round stone setting just next to a ship setting. An interesting project to follow! 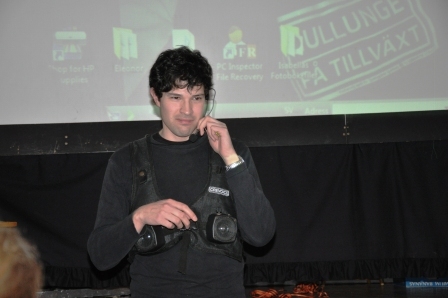 Last speaker of the day was Rune Johansson who works as a nurse and are studying archaeology. 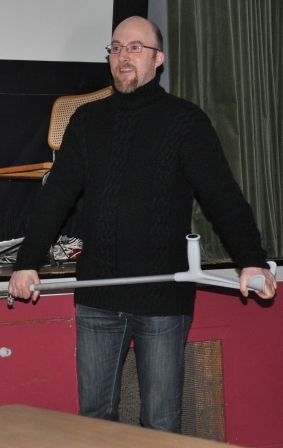 He presented his thoughts on archaeology as a rehabilitation tool. As all people have a history most have a connection with the past and therefore it is a way to get people interested. 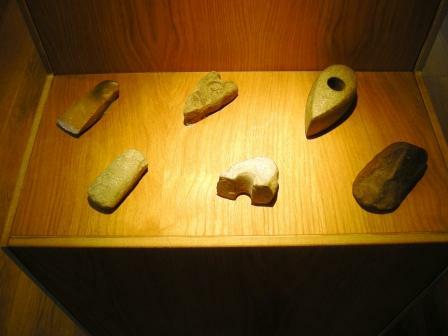 There are also several things in archaeology that can be therapeutic, walks in woods, feeling artefacts, associations between artefacts and modern things, being part in projects such as digs etc. 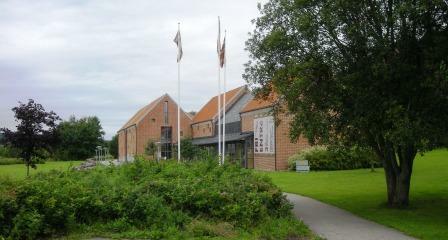 Last Wendsday we went to Vastergotland and Lodose museum, the plan were to go to Lodose (Lödöse) museum and then slowly return via the northen parts of Vastergotland to Jonkoping stopping at ancient monuments etc, the weather got a bit bad though so all we did was visiting the museum, which in itself was well worth the trip. Lodose is small town ca 40 km north of Gothenburg. Lodose is possible best known for the finds from the medieval town, ca 1/3 of the medieval town has been excavated, the cultural layers are up to 4 m in depth and more than 150000 finds has been registered. Lodose oldest parts as a town is from the 10th century, this is not say that there isn’t older phases, it was one of Sweden’s main port and trading cities in the Middle Ages and for a long time the only facing west. Due to changing natural conditions the operations were relocated during the late 1400’s and 1500’s to what came to be Gothenburg and in 1646 and Lödöse lost its town privileges. 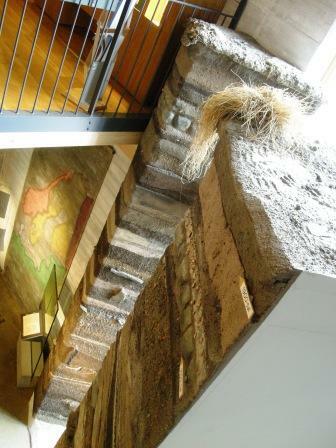 The museum is primarily an archaeological museum with a focus on the medieval town Lodose but they also have a nice exhibit on the prehistory in the Gota river valley. The museum opened in 1965, and the new museum opened in 1994. I must say I like this museum, is just big and/or small enough, the premises are fresh and the exhibits interesting. The exhibits are what could be called a bit traditional (which I find positive) but at the same time it feels fresh and up to date, lets call it post pomo pro retro. 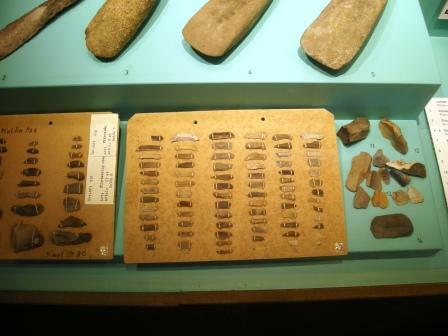 There are plenty of findings in the displays, they are partly broken down in traditional groupings such as trade, port activities, crafts, etc. but the artifacts returns in several contexts which shows that they are multicontextual, eg. it dispalys that we must interpret them according to the context . The information is narrative but leaves room for interpretations and questions, though the visitor isn’t left on his or her own as I feel has been the case in some museums in latter years. This is an example of a museum that uses their collection in a good way, that trusts the value of the artifacts in themselves and in their contexts and dares to tell the story of them. This is the kind of museum that I like! 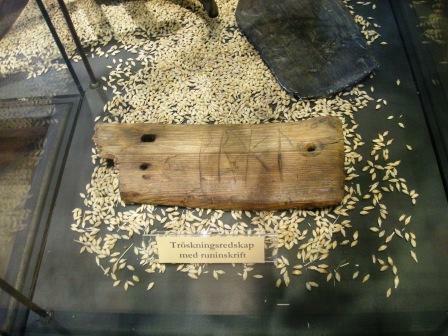 As you can see below runic inscriptions can be carved into almost any object. 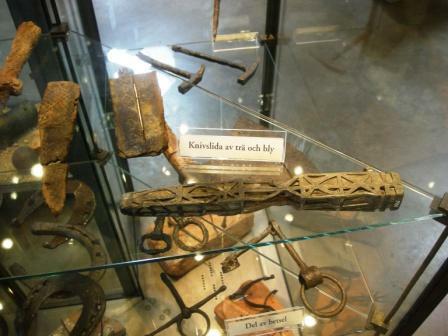 These medieval finds shows that runes were used by all groups in the cities, in other words rune literacy during the Middle Ages are high in the cities. Still we find very few finds of this sort in the country side though this might be due to preservation possibilities. 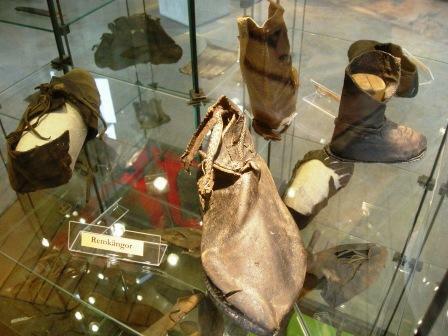 In the deep cultural layers of the medieval towns there is a much better chance for objects of tree or leather to be preserved. 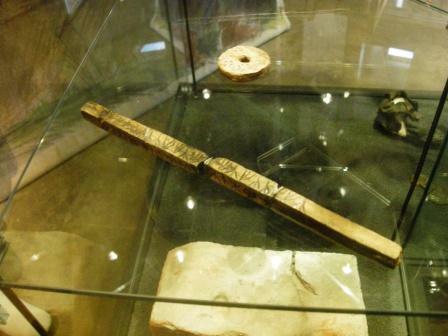 At the back; part of a Besman scale, in front; a measuring tool with a rune inscription. 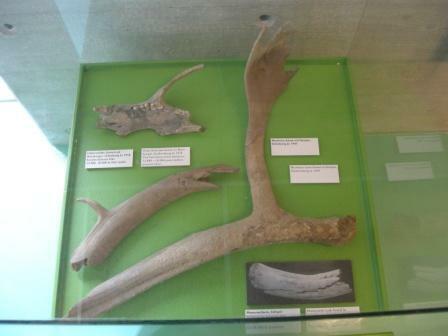 Antler from a reindeer and a jaw from a polar bear. 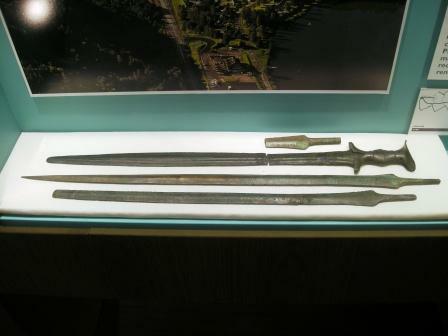 The finds are dated to ca 13000-10500 BP, in other words from the end of the ice age. These flint scrapers are either from the late Neolithics or the Bronze Age. 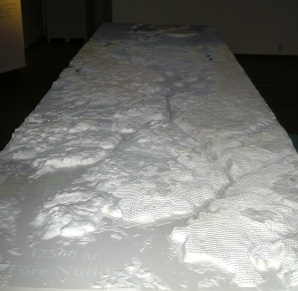 The next display is a 3-D model of the Gota river valley on which is projected how the country has raised itself and the valley has changed over the last 12 000 years, since the last ice age, and how man has taken possession of the landscape. A good presentation that is clear and makes it easy to see the changes, man made as well as natural. I miss one thing though and that is markers that show where today’s societies are. This is shown in the very beginning of the presentation but I feel that the presentation should gain on showing this all the way through. If you’re in the neighborhood this is a museum you shouldn’t miss, it’s well worth a detour. It seems I’ll stay for at least another month ’til the end of April as I got offered a prolongation of my employment at the County Administrative Board in Norrbotten. So perhaps I’ll see a Norrbottnian spring as well as a winter. It’s been nice to have had a real winter; with lots of snow and cold temperatures. Down south where I’ve spent most my winters the winter is more of a period of grey; a perpetual mix of fog, rain, sometimes snow and thaw. Later this month I’m going to Thessaloniki (Θεσσαλονίκη) in Greece for a few days, if anyone has tips of must visit sites in Thessaloniki please write a comment. As it looks now; the coming Monday will be the start of my last month in Norrbotten County, at least for this time. So in about a month I will be back in Stockholm – this has both pros and cons, it will be nice to come home but I will miss colleagues, work and newly acquired friends. So it is high time to start job hunting. Luckily there are some openings, a few museums are looking for staff for the upcoming season and a couple of substitutes and also there are a few ads regarding employment at a couple of County Administrative Boards and at an archaeological entrepreneur. This also means that it is time to update my CV and write something smart about myself. I’ve begun to contacting a few selected museums, archaeological entrepreneurs and County Administrative Boards that I would like to be associated with or work with. This time around I’ve also turned to the international market and applied for a job at Museum of London; which could be very exacting. In other words, I am open to suggestions! (Preferably regarding archeology or osteology). Well I’ve got a month left of employment so I’ll know what to with my time, and luckly I also got a few days of vacation to use before March 31st; This will be used for among other things a trip to Thessaloniki in Greece at the end of the month. 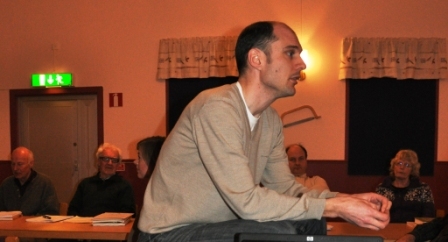 At February 14th 2009 the (Swedish) Osteological Association held their annual symposium/work shop in cooperation with Osteoarchaeological Research Laboratory (OFL), Stockholm University, under the title; “Bird and fish bones – methods and seasonality”. 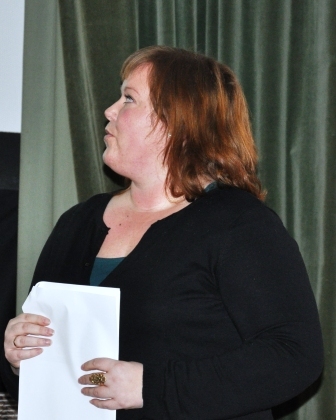 Carina Olson (PhD), Osteoarchaeological Research Laboratory Stockholm University. “Tolkning av fiskben från arkeologiska lokaler”. 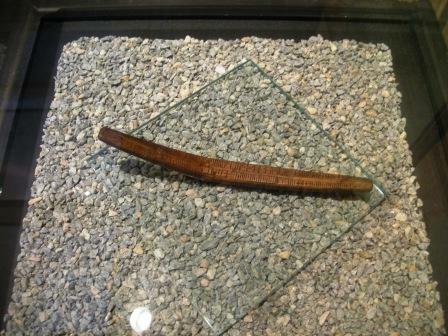 (Interpretation of fish from archaeological premises). 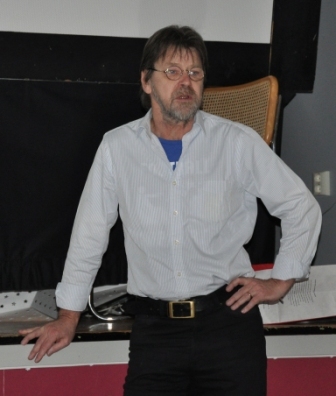 Inge Bødker Enghoff (PhD), Natural History Museum of Denmark (Zoological Museum), University of Copenhagen. “Archaeoichthyology: Size estimates and repesentation of skeletal elements”. 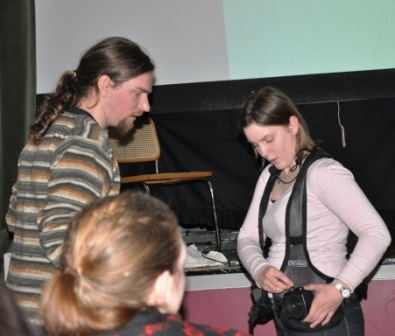 Kristiina Mannermaa (PhD), University of Helsinki, “Bird bones in graves at Yuzhniy Oleniy ostrov (Russian Karelia)”. First out is Carina who talks about the importance of the right archaeological field methodology and what different field strategies might result in. And with this she sets the theme of the day. In her dissertation Stone Age fisheries in the Baltic sea – Subsistence, marine environment and lifeways of Neolithic people along the east coast of middle Sweden, Gotland and Åland (2008) Carina presents several interesting and new finds many of them due to different test of methodology; different sieve sizes, resieving and sieving of samples in the laboratory. Among the finds are herring in contexts they previously not have been found. She also discussed methods for size and weight estimations of cod and methods of estimate seasonality. Overall an interesting lecture, by the way her dissertation is a must read if you’re interested in fish osteology in general or the Neolithic fauna in the Baltic Sea. It’s never easy to follow a good lecture but Inge Bødker Enghoff did a good job. She painted a general picture of the Stone Age sites of Denmark using fish as the common denominator. Using different examples she discussed methods on length estimation and what it can tell about fishing methods and seasonality, e.g. the importance of knowing the fish life history. She also talked about the importance of field methods to the result, without the fine sieves we’re bound to miss whole species witch can make us misinterpret the material. Example of fishes that we might miss is eel, herring and smelt. Kristiina Mannermaa was the last woman out and here we changed from fish to bird, but field methodology is still central for the interpretation. 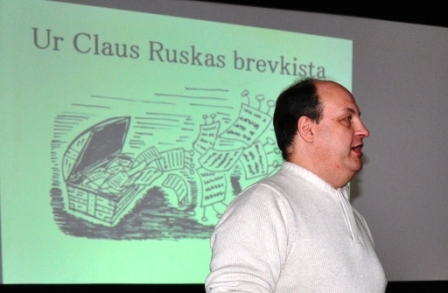 Mannermaa talked about a Russian material from Yuzhniy Oleniy Ostrov in Karelia. This is the largest known Mesolithic cemetery in northern Europe, dated to ca 7500 BP. The graves were investigated in 1937-38, in the end at the brink of war which makes it important to know when the grave was excavated; some graves were documented in a bit of a rush. 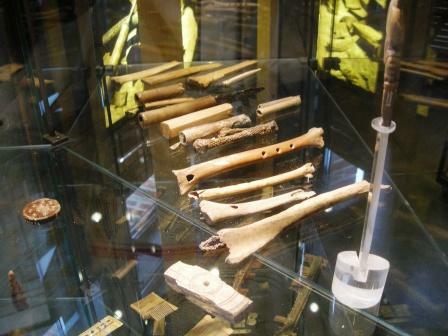 The skeletal material is well preserved and includes both human skeletal remains and a variety of grave goods such as animal bones, both unmodified and in the form of artefacts. Mannermaa has been successful in refinding the bird bones found in the graves, unfortunately many of the bones are no longer possible to match to what grave they were found in. The most common bird species in the cemetery was the osprey (Pandion haliaetus). By studying the location of bird bones in burials as well as the distribution of anatomical elements, it is possible to interpret the roles of birds in the burial practices but also the behaviour and ecology of these species. Table one regarded Bird bones and was held by Kristiina Mannermaa. Among other things she described problem bones and pressed on the importance of a good reference collection and of allowing the estimation to take it’s time. An interesting thing she put forward was the likeness of the femur of Crane (Grus grus) and Capercaillie (Tetrao urogallus). Now these bones are uncunningly alike even though the birds themselves are not. There are of course differences but you must know to look for them in the first place. It’s a bit of an eye opener; I guess that I might very well have been satisfied just looking at one of them. At the second desk stood Carina Olson and described the method of measuring otholits and allowing us to study them closer, both via microscope and by measuring instruments. 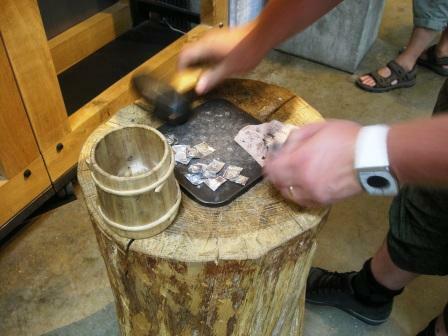 At third and final table Inge Bødker Enghoff showed us how to separate the first four cod vertebras. All in all a really good day, filled with interesting lectures, a good work shop and last but not least the possibility to reconnect with friends and colleagues through Osteology. Next year it’s my turn to make sure that we manage to make yet another good da capo. I’m not worried though as I have a fine board helping me out this year. On occasion I’ve lend my blog to the (Swedish) Osteological Association (OA) now there is no need as the OA gotten a brand new blog; most parts are written in Swedish but there is also an English section and some blog post will be bilingual. The OA was founded in 1978 with the aim to promote interest in human (physical anthropology/bioanthropology) and animal (zooarchaeology) osteology from prehistoric and historic contexts. At present we have about 50 members, mainly in Sweden, but also in Norway, Denmark and Finland. We publish an Association Journal; Benbiten. If you got an interesting article or information on conferences, work shops, links etc. please contact us via the (Swedish) Osteological Association blog. From February 2009 I am the head of the Association and therefore it’s mine and the board’s responsibility to keep it alive. For 2009 we plan to publish two issues of benbiten and hold a seminar and/or a work shop. Welcome to visit our new blogg! If you have any ideas on what’s missing or what we might add please write a comment. Some years ago I got a couple of boxes with eagle candy, e.g. the leftovers collected underneath eagles nest. These were collected in the 70’s and given to me a few years back. They’ve never really looked through been neither by the colletor or me and has been stored in my food cellar until now. As you can see on the pictures there are lots of parts of plastic bags which show that they have dived in one way or another but mice or other rodents have been feasting in the boxes and destroyed the plastic bags. I and my fiancée, who sheers my interest in bones; her particular interest is fish bones, started to sort them today. As there was a bundle of them it took the better part of the day just to sort the fish from birds, we also found some bones from rodents and other small animals. This is therapy work with an osteological edge; it is fun and interesting but a bit bizarre. Fur beetles (Attagenus pellio), larder beetles (Dermestes lardarius) and rat/mice turds made the process a bit groce. But all in all we found a lot of interesting bones that will be part of our reference collection, will have lots of doubles so there might be some if anyone interested though we have some who already queues. Most of the bones are from birds; wading birds, ducks and hens of different sorts and of course fishes such as pike, herring, perch etc. In the future we will take the bones to the osteological laboratory and art determine them. In a way this was good preparation for the Osteological association’s seminar tomorrow (today) which is called “Bird and fish bones – methods and seasonality” (more info here).